Violence creates trauma in society and to the individuals involved leaving them feeling vulnerable, disempowered and betrayed - whether the violence is perpetrated by strangers or loved ones, a victim of violence will feel bewildered on many levels. Common after effects are trauma and anxiety which can create physical symptoms including impaired sleep, hyper-arousal and depression - these symptoms really need to be worked through in a holistic way, every individual through their own experiences in life will have had other experiences that will in some way reflect their own reactions to the betrayal that is violence. As a community we need to bring more awareness to these issues. We also need a more proactive approach to underlying causes like alcohol and drug issues, domestic violence, anger management and bullying. Education programs based on personal responsibility can result in a reduction of violence in society and help bring some understanding for perpetrators of violence. Enough is Enough runs early education youth programs in schools and Anger Management programs in small groups for adults. 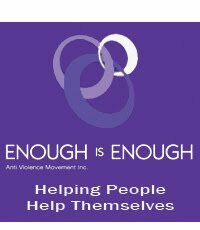 At Enough is Enough we run many workshops and groups for educating people of all ages about these issues both for victims and perpetrators. Our emphasis is on “helping people help themselves” through developing strategies for positive changes in their lives. Our counselling services help people in the community to overcome the effects of crime and violence. Support services provide a caring environment in which people may share their experiences with others in similar circumstances, feel supported and gain access to information. Other services include “Conferencing” where in a structured, assisted, safe, format, victims get a chance to confront those who have caused them harm and “Advocacy and Court Support” which can be organised where additional support is required while people attend court.